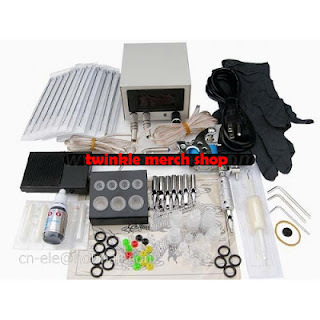 1 LCD screen Top quality professional power supply system (can work under 110V/230V, and we will send the plug fitted your country.The power supply plug, we provide different power cords and plugs to meet different customers). 1 pc of Ink Cup Holder 100 pcs of ink cups. 1 pc stainless steel Tattoo Machine Grips. 8- different- size stainless steel tips (nozzles). 10 High quality pre made sterile tattoo needles (the sizes from round liner 3,5,7,9; round shader 5,7,9; magnum 5,7,9; 5 for each size). 1 pcs professional tattoo machine for lining and shading (10 warp coils). 1 Set of adjust tools and other attachments. 1 pcs of Tattoo Practice Skin. 1 bottle (20ml/bottle = 3/4 OZ) of great quality black tattoo ink. 1 pcs disposal grip with needle.